Aggregation is a process in which a single entity alone is not able to make sense in a relationship so the relationship of two entities acts as one entity. I know it sounds confusing but don’t worry the example we will take, will clear all the doubts. In real world, we know that a manager not only manages the employee working under them but he has to manage the project as well. In such scenario if entity “Manager” makes a “manages” relationship with either “Employee” or “Project” entity alone then it will not make any sense because he has to manage both. In these cases the relationship of two entities acts as one entity. 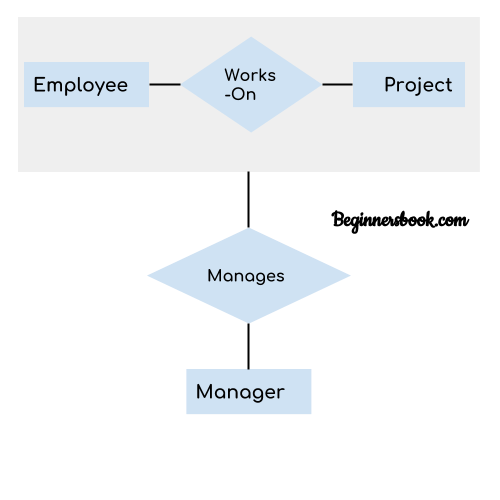 In our example, the relationship “Works-On” between “Employee” & “Project” acts as one entity that has a relationship “Manages” with the entity “Manager”.